Often times, the air inside the home is more polluted than the air outside. This is usually because dust, mold, pollen, bacteria, viruses and other common pollutants get trapped inside the home. The Plixio PLX50 air purifier is perfect for providing cleaner air in any small space. Those with allergies and asthma understand the importance of having clean air and being able to remove pollutants from areas that aren't well ventilated. The PLX50 eliminates odors from pets, smoke, bathrooms and kitchens. It doesn't just mask smells, it helps get rid of the agents that cause odors in the first place. Air ionizers work by activating oxygen and negative ions to eliminate harmful bacteria. The dial on our air ionizer can be adjusted for full purification or kept low for a quiet and consistent purification. 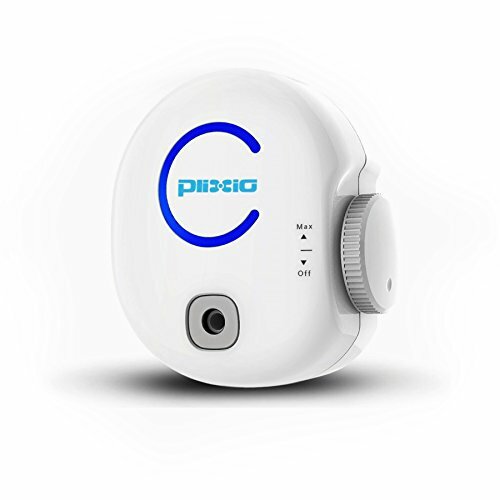 The PLX50 will work great in homes, offices, closets, dorm rooms, laundry rooms, bathrooms and is great for travel. It weighs under 8 ounces and measures 4.5 X 4 x 2 inches so it fits easily into any room without taking up too much space or drawing too much attention. Each unit can cycle up to 100 sq ft. We recommend using two units for any space greater than 150 sq ft. The PLX50 runs on less than 7w of power and comes with a full one-year warranty. Cleaning the unit is easy-- just lightly vacuum the unit once a month.